Dutch pianist. His work revolves around matters that escape conventional notation: sound, timing, space, physicality, memory, noise, environment - the points where interpretation, experience and improvisation touch. He performed premieres of works by Robert Ashley, Alvin Curran, Maria de Alvear, Charlemagne Palestine, Francisco López, Kaikhosru Shapurji Sorabji, Walter Marchetti, Jerry Hunt, John Oswald, Scanner, Michael Pisaro, Giacinto Scelsi. 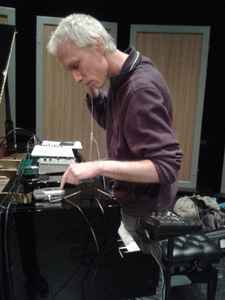 He has worked with the composers John Cage, Luc Ferrari, Alvin Lucier, Olivier Messiaen and with the theater companies Hotel Modern and Andcompany&Co from Berlin. He is one of the prime movers behind experimental music outfit MAZE, an offshoot of the MAE/Maarten Altena Ensemble. MAZE works with artists like Christian Marclay, Elliott Sharp, Robert Ashley, Christian Wolff and Tony Conrad. Since 2012 Reinier van Houdt plays in David Tibet's Current 93/Myrninerest.